BSE carries Senco fastening equipment parts and supplies. We offer factory authorized repair at our Bakersfield, Tehachapi and Visalia locations please contact us for more information. BSE is your local source for STIHL Chainsaws, Industrial Cut-Off Machines, Trimmers, Hedgers and Handheld Blowers. STIHL is only sold at servicing dealerships. We offer factory authorized repair at our Bakersfield, Tehachapi, Visalia and Sedona, AZ locations please contact us for more information. Kraft Tool Co. established in 1981, manufactures quality Trowel Trade Tools for concrete, masonry, drywall, plaster, asphalt and tile professionals. As a trusted name in hand tool industry, Kraft Tool is proud of the Hand Krafted workmanship attributed to every product. Our goal is simple: Maintain quality, provide good service and offer new innovative products. You are sure to find high quality tools ranging from levels and trowels to straightedges and jointers. Setting the standard for quality since 1890. Marshalltown Company is more than a manufacturer of premium quality trowels. We are committed to leading the construction tool industry and providing the best products for the contractor to complete every job with the best results possible. Join the zero-turn revolution! BSE is your local distributor for HUSTLER Zero-Turn Mowers. Since 1964 HUSTLER has been the industry leader in zero-turn mower technology. Weather you have residential or commercial mowing needs we can help. Come in and check out our complete line of mowers and accessories. Founded in the early 1920s, Corona Clipper, Inc. is a leader in the marketing and manufacturing of professional and consumer tools for the lawn and garden, landscape, irrigation, construction and agriculture markets. Using proven designs, quality manufacturing processes and unparalleled customer service has made Corona the best choice in tools for contractors, agricultural professionals and avid gardeners alike. The name L.M. Scofield Company represents the oldest, and one of the most trusted manufacturers in the business of Decorative Concrete Manufacturing. This recognition comes from more than 90 years in the industry, creating high standards for products that form a virtually unlimited menu for coloring and texturing concrete. No job or worksite is perfect; that is why Keson tools and Keson service have to be. Since 1968 tradespeople and contractors have relied on Keson. We are a leading supplier and manufacturer of innovative, high-quality, measuring and marking tools. 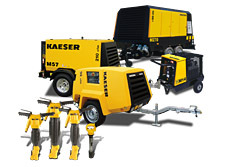 Kaeser Mobilair portable screw compressors are designed and built for rugged use and dependable performance. These powerful units provide a reliable source of compressed air for construction sites and other industry applications such as demolition, sand blasting, sprinkler irrigation and monument engraving. A wide range of models and accessories are available to suit virtually any need. Since 1968 Stegmeier LLC has been manufacturing innovative and contractor-friendly products for use in the installation of Decorative Concrete. Our products are distributed nationwide through a network of construction supply and swimming pool supply distributors. Stegmeier has the most complete product line with the largest number of distributors in the swimming pool and decorative concrete industries, making it possible for us to provide the highest quality of products and service to the customer. NewLook International is the leading manufacturer of premium and innovative decorative concrete solutions. Our revolutionary and proven systems have been used since 1989 by industry professionals and property owners alike to dramatically enhance the image of concrete. Whether you are a concrete contractor, decorative concrete supplier, architect, designer or DIY customer, NewLook has a specific range of innovative and environmentally friendly products that will compliment your own range of solutions--making us your experts in surface enhancing solutions!